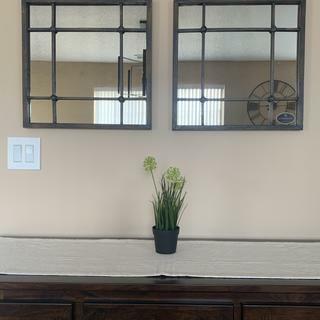 L: 1" x W: 19" x H: 19"
Saragano Square Wall Mirrors: Set of 2 These Saragano square wall mirrors feature heavily distressed, slate blue frames with aged ivory accents and antiqued mirrors. These Saragano square wall mirrors feature heavily distressed, slate blue frames with aged ivory accents and antiqued mirrors. Love this design, perfect size. It goes well with the Kona Server we also got from Raymour. Just the right finishing touch! Perfect size! Great quality! Worth every penny! Just what we needed to put on either side of some wall art that we just purchased. Love these pieces! The description states heavily distressed, slate blue frames. How blue are the frames? From the photo, I thought they were metal. I am trying to accent a room with dark teal blue drapes. BEST ANSWER: Hi ! I love these so much.They look just as they do in the picture. Nothing blue on mine. Looks more metalic . There’s no blue at all. It’s a dressed wood look but they are metal. We have these mirrors and there’s almost no blue in them.